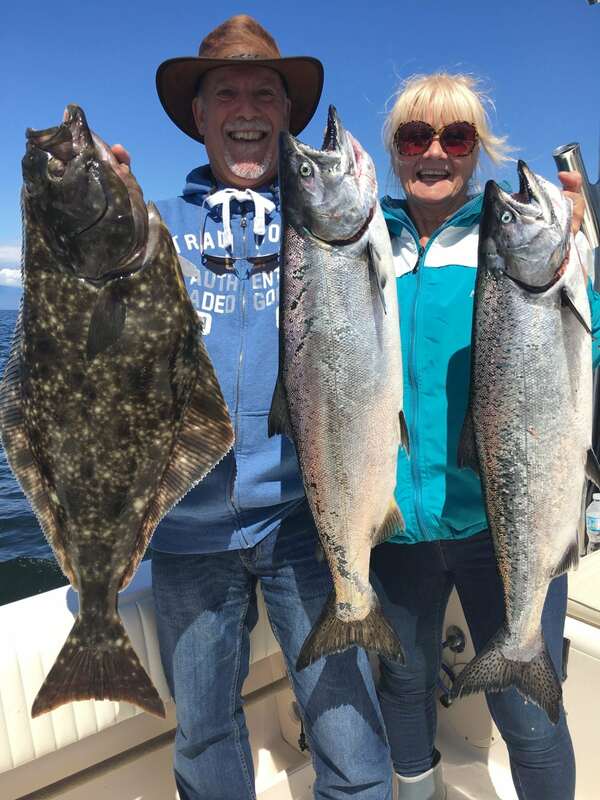 Fishing was pretty decent this past week with some success locally as well as decent fishing around Gabriola. The hotter fishing has been on the other side on the days we have been able to get there, so let’s start there. Three in the boat at the start of a Thrasher trip this week. Always fun to have a double header on the boat! For the most part the fish have been fairly deep and we are fishing inshore on the structure. Depth of water can range from 120 to as deep as 240 and our gear is generally close to the bottom as that is where the bait is. Hootchies seem to be producing the best, in particular the blue splatter, green splatter, and chartreuse splatter hootchies with as 32-35 inch leader. Productive flashers have been blue glow, chartreuse glow, and green glow. 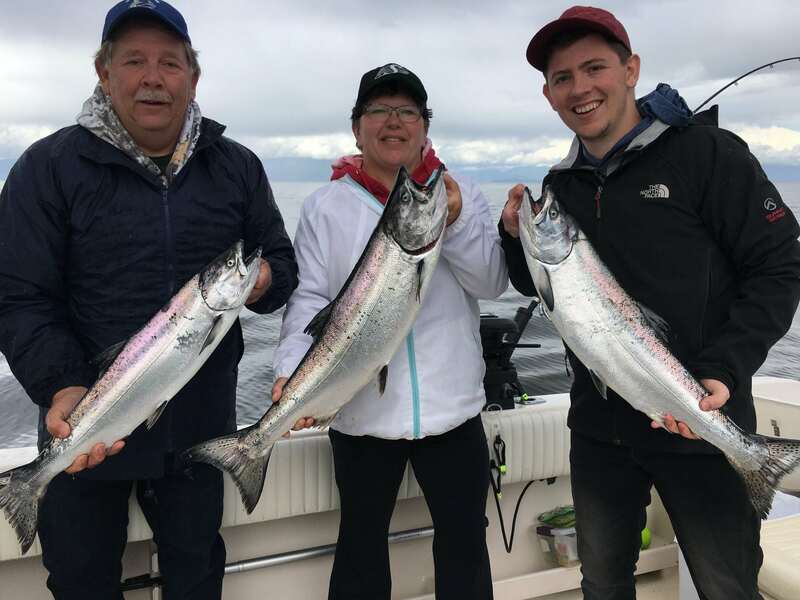 If you get your chinook, try going shallow and head offshore into 1000 feet and look for coho as there has been schools of coho feeding offshore. We have seen some on the surface but generally productive rigger depths will be 25-100. White UV hootchies are always good producers for these fish. Bottom fishing has also been decent. Always nice to add a surprise halibut to the mix! Locally there has been a few fish around off South Bowen and up to Gower Point. There are little pockets of bait and fish and when you find them you can have decent action. Best depths have been 90-150 on the riggers. There seems to be lots of “just unders” in the area as well, so looks like we have a good number of feeders in the area. If this fish continue to hang around and feed on anchovies and herring, it could give us some good action later on in July. 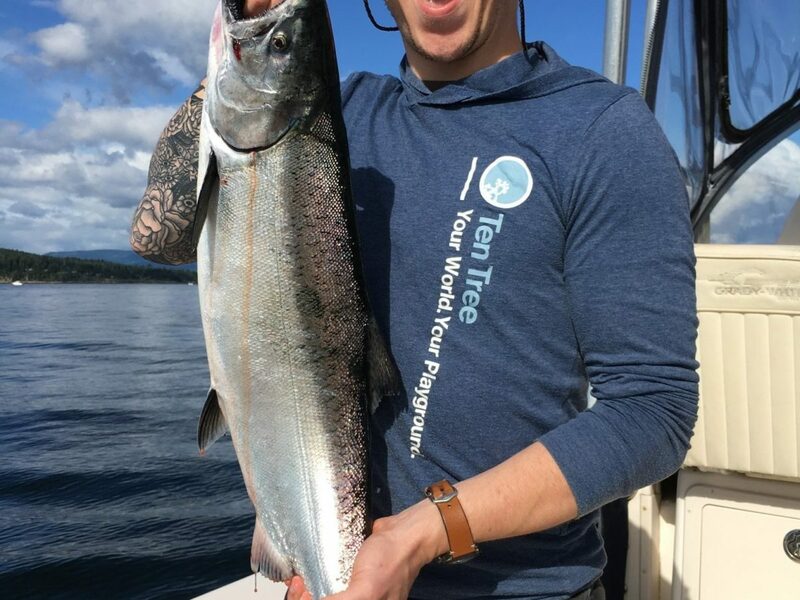 Mike with a nice fish on a local trip this week. Crabbing has definitely picked up the last couple of weeks with some of the best sets of the season these past few trips. The commercial fleet will be open in the next week or so and that makes it much slower, so best get your crab while you can. Ambleside 2017 – photo credit, Corbie Fieldwalker. It is getting close to the arrival of salmon at our local beaches. Yes it is time to get ready for another season of beach fishing for coho. I have checked the beach a couple of times for the past two weeks to see if by any chance there are fish, but haven’t seen much to shout about. I will be going regularly for the next 4 months, as it is my favorite fishery. We need the Capilano river level to stay low for the salmon to start accumulating in the estuary. This year its just coho so there won’t be any pinks to entertain you while you are waiting to hook one of the stubborn coho. 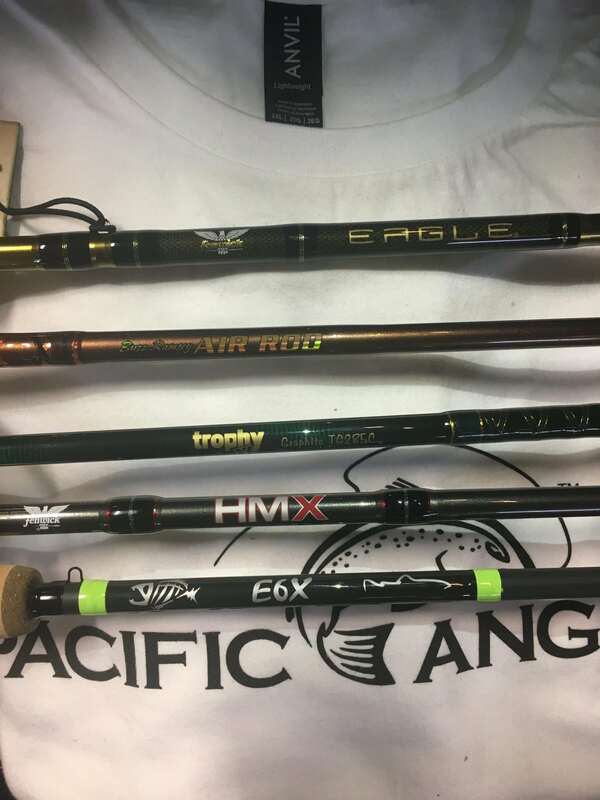 Get your 7-8 weight rods with a floating or intermediate line and be sure your gear rods and terminal tackle are ready for the closest and convenient fishery in our city. The flies are already in the store. I have spent the last 32 years on our local beach gathering information about ocean entomology, behaviour of the fish and experimented with different tackle setups so if you really want to have a better understanding of what to tie. 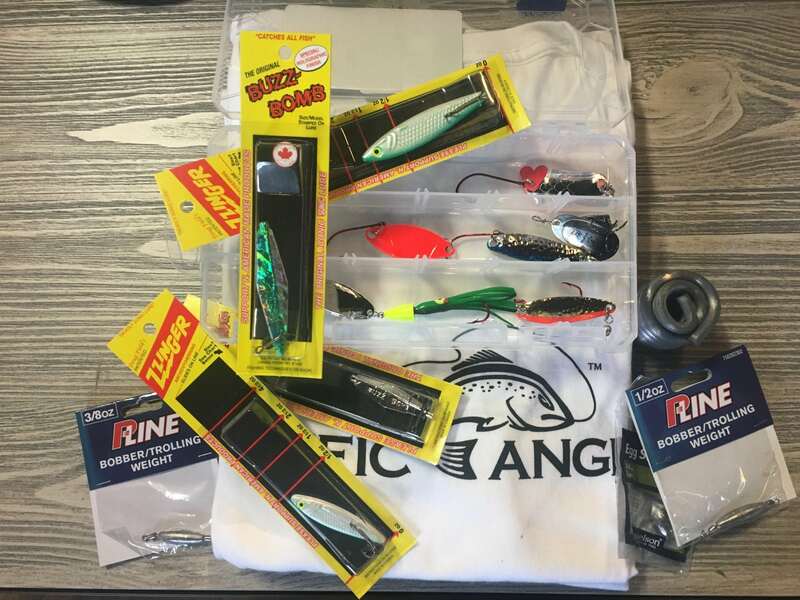 Dustin has been gear fishing the beach for the last few seasons and blow this report he has a great write up on which spoons and spinners to use if you are gear fishing. As always please come to the shop and we’ll fill you in on more details. It is almost the time of the year that people would be starting to fish off the Ambleside beach for salmon. 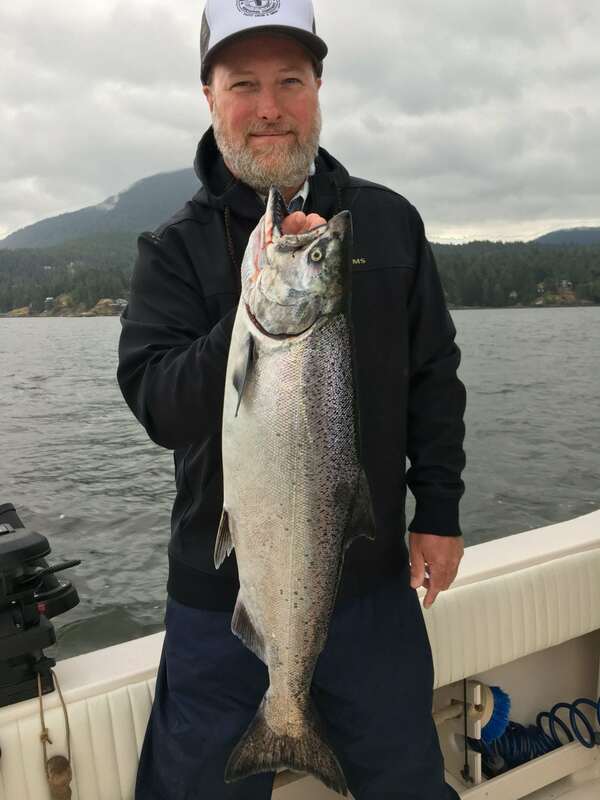 There are lots of methods to chase the elusive coho salmon off of the beach but I will be focusing on the gear side of this fishery. The best lures to use in this fishery are size 4 Blue Fox Vibrax, 3/8 oz Gibbs Croc, size 4 Koho & Kit-A-Mat, Spinz Hoochie spinners buzz bombs and zingers. If it is a problem getting some distances due to the wind and any other factors you should add some weight. You can add a small bit of pencil lead split shots or Egg sinkers above your swivel. You can also get the bobber/trolling weight from P-line. The ideal timing for the fishery is low tide when you can walk out to the small island. However, don’t stay out there for too long as the pathway becomes less visible. If you see people leaving, leave with them. For fly fishing it is very challenging to fish any time except the low tide. 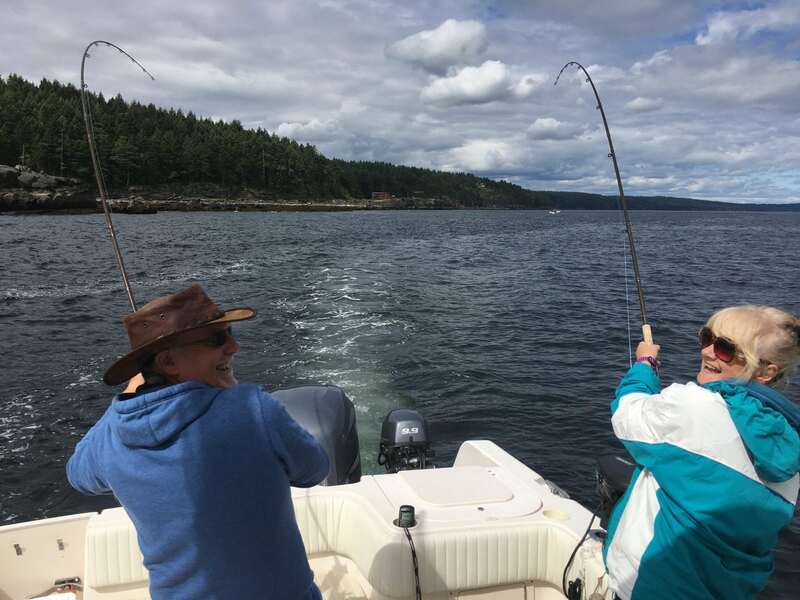 Though it is not as good as low tide, gear fisherman (because of the distance you can cast) can fish at other tides but you will need to learn where to stand so you do not snag up. Fishing off the rock jetty or at the mouth of the river is an option at almost all tide levels. 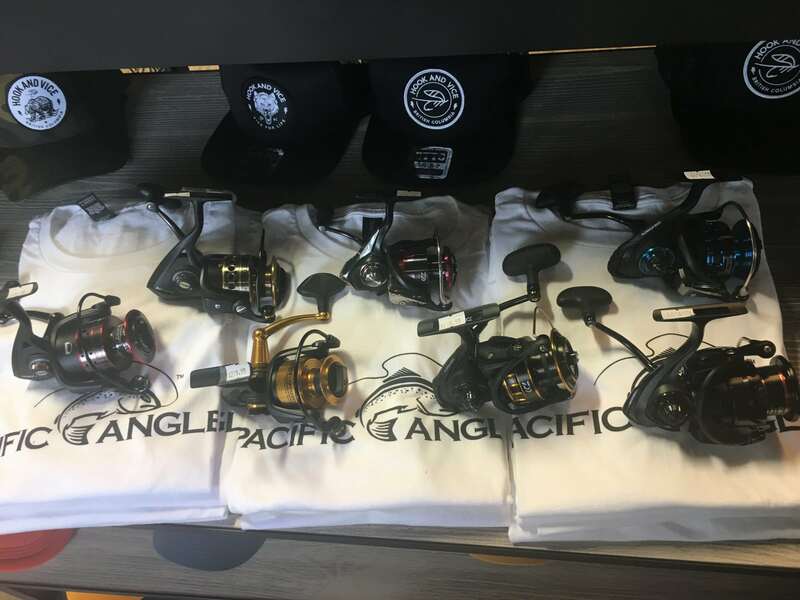 If you do have any questions about the set-ups and know-hows give us a call at the shop, or shoot me an email at dustin@pacificangler.ca.